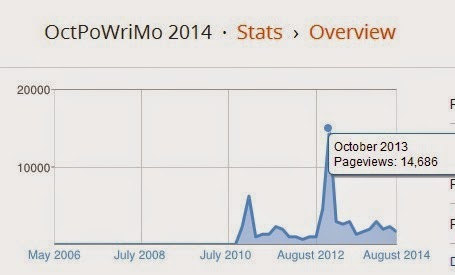 The first year OctPoWriMo had over 6000 visitors in October. The second year we had over 4000 visitors during September and over 14,000 in October. That is a lot of visitors! This year we can expect that and probably more. If you are an indie author, have a poetry ebook or paperback and would like to display your book cover on OctPoWriMo during the month of September and/or October, please see the rates below. If you are interested in displaying your poetry book cover, please send your query to: Morgan Dragonwillow at morgan_dragonwillow@hotmail.com with OctPoWriMo in the subject line and the title and link (not a shortened link, full link only) to your book on Amazon. Thank you Tui, I am excited about the coming OctPoWriMo challenge and what wonderful poetry it will inspire! Oh, I'm just now seeing this! What a lovely idea to help promote all the Indie Authors. Thank you for all you do! This will be my first year doing the October Poetry Writing Challenge. What a wonderful idea you came up with. Thanks for letting me join in on the fun.